S22E04: "Tegridy Farms" preshow discussion. The Vaping epidemic hits South Park Elementary. 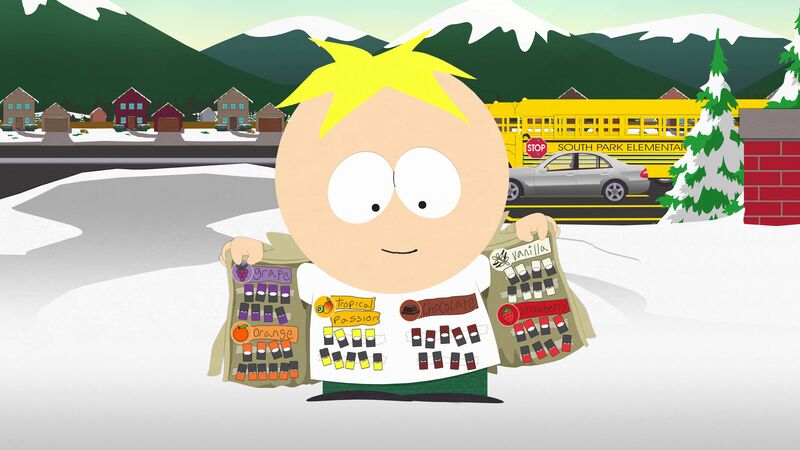 Butters is selling vape pens and all kinds of fruity-flavored vape accessories at school. Meanwhile, Randy decides he should move the family to the country and take up farming. I guess this means Stan won't be at school, so if he talks to Wendy, it will be on the phone or online. They last talked to each other in "The Damned" two years ago. Randy moving to the country and taking up farming sounds like "Green Acres," in which New York lawyer Oliver Wendell Douglas longs for a simpler way of life. So he buys a farm, sight unseen, and moves there to live off the land, much to the chagrin of his socialite wife, Lisa. I can imagine how Sharon would feel if that's the case. Re: S22E04: "Tegridy Farms" preshow discussion. Sounds better than last week's. I didn't even bother with it, looks like I didn't miss much looking over the synopsis of the episode. Anyway, this could be really hilarious with the Marshes moving to a farm. The reasons I'm sure are silly and whatever chaos ensues will be funny. Of course it is the latest idea from Randy to which Sharon, Stan, and Shelley will groan and roll their eyes at. But as usual they have no say and will play along. I wish it were an actual Stan episode, it was great to see Sharon in the spotlight a couple weeks ago, and of course now there has to be a Randy plot. I wanna see an actual A-story with Stan. The Butters plot seems a little meh. Not sure why he'd be selling vaping products. Again, something I don't understand is so 'in' these days since I don't smoke. I'll just be watching for the Marshes-on-a-farm story. Sounds so simple of an idea so looking forward to see what they do with it. I love: Stan, Butters, Cartman, Sharon. Sharon: What is it honey? (gasp!) My baby's killed again! Haa, I love that line. I was going to guess he was farming Herb. Close enough. Hemp. This one looks great! I think it is a play on words for the name of the farm. Butters seems to be the one that needs some integrity. Is it a marijuana farm or just hemp? I remember the last time Randy bought a business being the Blockbuster one and Shelly burned it down, so will she burn up all the help or marijuana in this one? I’ve never vaped but it seems cool. I like that Butters is the one selling the stuff and Ike is addicted. Cartman hitting Butters for Kyle was interesting. I’m sure this one will be a 9/10. 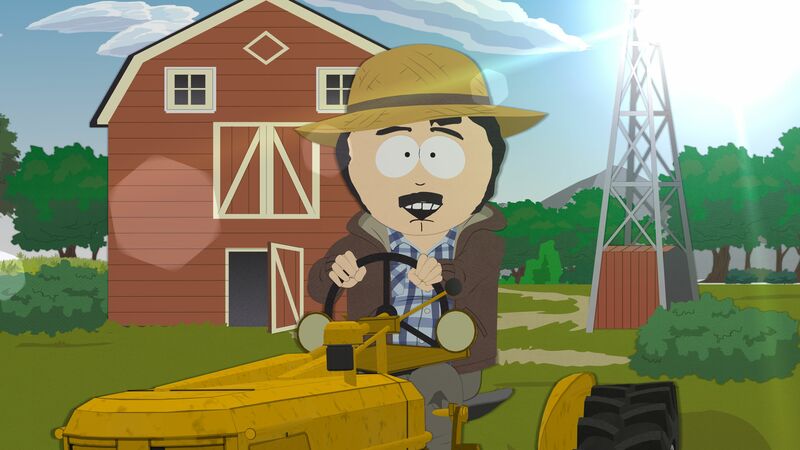 Randy running a hemp farm and Butters vaping? I don't think it'll play out this way, but it reminds me a little of "Medicinal Fried Chicken" contrasting fast food restrictions versus marijuana legalization. I certainly think the preview is one of the better ones we've had, telling us a lot about the episode in a really effective moment; I also want to note this season has been surprisingly strong so far at re-affirming the Four Boys as a unit, doing Game Night together two weeks ago, last week with Kyle, and here playing against Butters. Nice contrast after a few seasons of the boys' extended group. I don't know what to expect from the farming story, but I'd like to hope it's more than Randy on a Tractor. How might Sharon, Shelly and Stan play into it, if we're lucky enough to see that? Might we get a chance to see one of the show's other recurring farmers, if only briefly - the old mechanic, the bowling alley janitor, Denkins? I don't know. It has potential but it gives me a worried feeling. When I watch the preview clip it has Butters eclipsed by the sun, I can't help but think of the cover of the children's book "The case of the stinky stench". I wonder if Betty has that kids book? You know, weed has been legal in Colorado for like 5 years now and the guys have yet to do anything with that. I can only guess that now that California has stepped up its cannabis game maybe they've had more first-hand experience with its impact on everything. Plus there's been like cable shows where dudes are growing pot and maybe Trey has been watching them. Butters selling vape. Of course he would. Douchebags are all about that stupid bullsh*t. I like Butteres, don't get me wrong, but he can be kind of a douche. So it's only natural he would gravitate toward vape. Canada just legalized recreational marijuana so I wonder if this will be a Canadian episode at all?